Strictly Come Dancing's Craig Revel Horwood is taking over from Miranda Hart as Miss Hannigan in Annie the Musical at the Piccadilly Theatre. 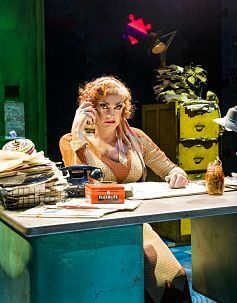 Horwood has already played the black-hearted Miss Hannigan (pictured here) for six months when the show was on a nationwide tour directed by Nikolai Foster . Miranda’s limited appearance ends on 17th September, and Horwood will take over the role from September 18th until November 20th on Sunday through to Friday, as Saturdays will be taken up with the next series of Strictly. He then goes on to play the wicked Queen in Snow White And The Seven Dwarfs at the Mayflower Theatre in Southampton from December 15th. Annie the musical is currently booking to February 18th.